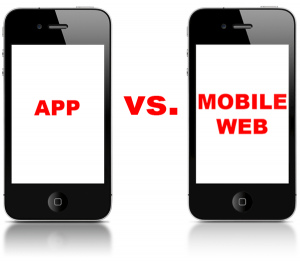 The mobile website vs. app debate – What’s the best choice? I’ve been asked many times regarding my opinion on whether a client should develop an app. Apps are all the rage and the buzzword du jour. When I’m approached to provide advice on the subject, my questions are usually “why” and “what are you trying to accomplish”? Usually the client’s answers lead me to tell them that developing an app is not worth the time, money, ongoing headaches and support issues. There are times where developing an app makes sense, but for most small businesses an app is not the best first step. Actually for most businesses, an app is the wrong choice. To illustrate and support my argument let me simply go through the important points and compare and contrast the benefits and issues as I see them. To confirm, I plan to be completely fair to both sides, but in the end I think you’ll believe that developing an app is not the best choice for your business. The most important thing with all these discussions is whether we can deliver information and services to people who want it as quickly and with as little hassle as possible. A mobile website allows a user to search or type in your standard website address and access the website immediately on any internet ready device. Period. If they have an internet connection and can search or type in the website address, they’ll see the website 99% of the time. An app in contrast must be downloaded and installed. This brings up a lot of technical issues, not to mention the time involved. A user must have space on their phone. Apps take up physical storage space that might not be available or limited. An app might not work on the phone that they’re using because they haven’t updated their system software. They might not even know how to download, install and access an app (you’d be surprised). So the course of least resistance is a mobile website. Mobile websites will work on all mobile devices with a browser and internet connection. Any mobile device that comes on the market in the near future will allow users to access a mobile website. Essentially a mobile website is a single solution for all platforms. Apps are developed for specific devices (iPhone, iPad, Android, Blackberry, etc.) and you need to download the correct version based on the device that you’re using. With any website or app you’re going to have changes, problems and things that you want to improve ongoing. Let me say it again, “You will have problems and you will want changes”. With a mobile website you can address those problems and changes immediately and roll them out to anyone accessing the website at that moment. Apps are, well, applications. That’s where the name comes from. They’re software applications that must be updated, recompiled, distributed to the specific device distribution point (Apple iTunes, etc.) and then downloaded AGAIN every time there’s a change. When you come to grips with the fact that there are ALWAYS issues and things that you must change, a mobile website becomes a much more appealing option. It will allow you to quickly and efficiently solve problems and make updates that are immediately available. Think about how you’re going to promote your mobile solution. With a mobile website you don’t have to explain where to download the site, how to install it, how to update it. You can simply promote your website and when someone arrives there on a mobile device it will show them the mobile content. 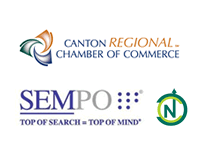 If someone searches for your business or something related to your services, it’s likely that you’ll show up in the search results. If they’re on a mobile device your site will be immediately available when they click the link. An app is only available from specific distribution points. It is also not available within search results on Google. So communicating with people that you even have a mobile optimized solution becomes another hurdle. Mobile websites and mobile content are easily shared with a simple, direct link. Every page of a mobile website can have clear calls and ways to email the individual page, share on Facebook and Twitter, etc. For mobile apps, sharing can be integrated as well. But you can’t directly send someone a link to something within your mobile app. A mobile website is much more flexible. Publishers and businesses can easily direct users to a mobile website from a blog or website, or even in print. An app simply can’t be shared as easily. Cost is always a concern for all of us. When considering a mobile website or an app there is a clear winner. Essentially a mobile website can be setup to simply present your website content in a different format for mobile users. It’s an all-in-one solution that allows you to develop, distribute, maintain, support and upgrade one solution ongoing. A mobile app is a piece of software that must be developed for a specific platform. This alone increases costs. Consider the time involved with design, development, testing, debugging, distribution, support, bugs, changes ongoing and everything else. If you’re supporting apps for iPhone, iPad, Android and Blackberry you can see how quickly the time could balloon and therefore increase costs dramatically. If your goal is to distribute any type of content to mobile users, there is no better choice than a mobile website. It’s possible with an app, but a mobile website can be integrated with a content management system that powers your main website. It’s one click and you’re done publishing for text, videos, service updates and data distribution. This one could be debated but the shelf-life of an app can be fairly short. For whatever reason (clutter, storage space, lack of use, bugs and problems) mobile apps stay on a user’s phone for less than 30 days. Mobile websites on the other hand are always available for your customers to return to and they never need to be updated. Lets face it, people are going to have questions, problems and will generally have issues. Both mobile websites and apps will require time for testing, compatibility, upgrades and ongoing development. You will need to plan time and an ongoing budget for support and updates. All I’ll say is: Do you want to support one mobile website that you can access and change immediately or do you want to support an app that’s developed and distributed to any number of different outlets, platforms and services. For my money I’m going to go with the obvious unless there’s a really, really good reason to support an app. If you’re developing a game or some other graphically intensive, animated solution. An app doesn’t require the user to open up a web browser unless they’re accessing something that’s only available on an external website. Lastly, an app will download and (usually) automatically create an icon on the user’s phone. A mobile website will not do this automatically, which might bring up concerns about your service staying “top-of-mind”. With a mobile site you can easily prompt a user to add the icon on most popular devices with a simple prompt. This is the only “hurdle” that I have with mobile websites. But considering all the other negative cost and accessibility factors I’ve mentioned, I’m going to officially cast my vote for mobile websites and advise my clients to consider the same unless they have a very specific reason to delve into that costly, time consuming and (potentially) difficult world of app development.